Emily Hahn, ca. 1937-1939, DeGolyer Library. Hahn was an American journalist and author who lived in Shanghai during the 1930s and was a close friend of Sir Victor Sassoon. Photograph by Sir Victor Sassoon. In July 2014, SMU’s Central University Libraries uploaded 459 items into our CUL Digital Collections web site. CUL Digital Collections now contain approximately 39,000 published items. Two albums of photographs by Sir Victor Sassoon. Landscapes, China and India, “Eves” and Garden, 1937 includes 24 images depicting boats and ships near Shanghai, China, as well as the transport of cars by a pontoon ferry in India. 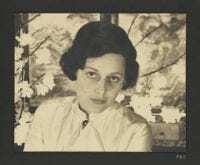 Portraits, Lucas Twins and Others, 1937-1939 includes 25 portraits and images, including Emily Hahn, Lorna and Kathleen Lucas, and other Sassoon contemporaries. [Front of Engine #1566 (4-6-0) after falling into turntable pit. ], October 17, 1911, by Jules Bourquin, DeGolyer Library. 112 photographs from the Jules A. Bourquin photographs, featuring images the Horton Depot and the Chicago, Rock Island, and Pacific Railroad Company. Of particular note are photographs of train wrecks, as well as images of military personnel passing through Horton, Kansas, en route to the Border War with Mexico. The collection also includes photographs of railyard workers, locomotives, trains, and everyday-life scenes in Horton. 10 builder’s specification cards from the Baldwin Locomotive Works builder’s cards, including the Central of Georgia Railway, the Central Iron and Coal Company, and the Central Railroad of New Jersey. 20 pencil drawings, charcoals, and lithographs from the H.O. Robertson Papers, featuring portraits as well as landscapes depicting the southwest. Subjects depicted include portraits of people, as well as churches, sheep, houses, and landscapes in Texas, Mississippi, and Illinois. ”Seeadler,” Germany, at the the Columbian Naval Parade, held in New York on April 27, 1893, DeGolyer Library. 48 photographs from the album, Columbian Naval Parade. The April 27, 1893, parade was held in conjunction with the World’s Columbian Exposition, which commemorated Christopher Columbus’ arrival in the in the New World 400 years earlier. 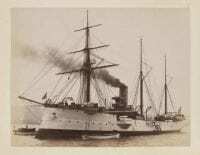 The images include ships from the U.S. Navy, as well as vessels from other countries. Also included are images of replicas of the Nina, Pinta, and Santa Maria. 2 photographs by William Henry Jackson, including Pueblo de Taos, New Mexico and The Rocky Mountains, Scenes Along the Line of the Denver and Rio Grande Railway, ca. 1875-1884. Geronimo – Apache, 1907, by Edward S. Curtis, DeGolyer Library. 5 stereoviews, ca. 1880-1890 from the Collection of New Mexico stereographs. Geronimo – Apache, 1907, by Edward S. Curtis. H. Willard, Son & Co., Dealers in Raw Furs… Prices Current – Season 1903-1904, a circular distributed by H. Willard, Son & Co. of Marshalltown, Iowa, advertising prices offered to trappers for animal furs. Prediger seminar der Deutschen Evangelischen Synode des westens bei Marthasville, Mo. (Preachers’ seminary of the German Evangelical Synod of the west in Marthasville, Mo. ), ca. 1870-1883. 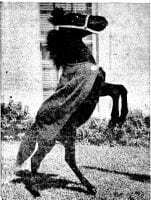 Photograph from front page of The SMU Campus, September 23, 1949, with caption: About as Big as a Firecracker but loaded with dynamite is the new Peruna. Born during last year’s football season, 28 inches high and black as a cinder track, Peruna the Fifth is a he. Students will see him at an assembly today and a rally tonight. Photo by Laughead. Held by SMU Archives. 114 issues of SMU’s student newspaper, The SMU Campus, covering the years 1949-1950. Topham Family Letters, Folder 1. Simon Thornton Topham, a polygamist, wrote these letters to his second wife, Mary “Lucinda” Robinson Topham, during the years 1887-1908. Simon and his family were members of The Church of Jesus Christ of Latter-day Saints. Under the Edmunds-Tucker Act the government was allowed to intercept the mail of those thought to be polygamists. These letters between Simon and Lucinda are part of a larger collection of letters from the Topham family. Hyer Hall, SMU, 1927, by Joseph Neland Hester. Held by SMU Archives. 11 photographs of SMU campus buildings, including several no longer present, all taken in 1927 by Joseph Neland Hester. The buildings depicted are Atkins Hall, the Basketball Pavilion, Dallas Hall, Highland Park Methodist Church, Hyer Hall, Kirby Hall, McFarlin Auditorium, Ownby Stadium, Snider Hall, Virginia Hall, and the Women’s Gym. Fort Worth Rail Yard, ca. 1923, a hand-colored print of a rail yard in Fort Worth, Texas. The photograph was taken in the early 1900s when the yard was owned by the Texas and Pacific Railway Company. At that time the yard was called Lancaster Yard after the president of the railroad, John L. Lancaster. Since then both ownership and the name of the yard have changed, and it is now known as Davidson Yard. 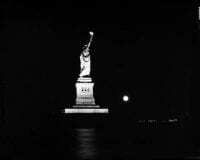 11 negatives by Robert Yarnall Richie of the Statue of Liberty at sunset and night on November 9, 1965, including before and during an electrical blackout. This entry was posted in aerial photographs, American Indians, Railroads, Robert Yarnall Richie, SMU Student Newspapers, Texas artists, U.S. West. Bookmark the permalink.